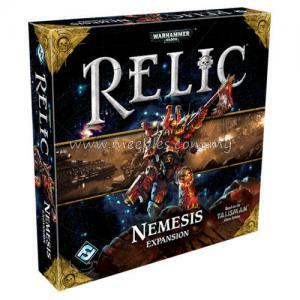 Nemesis, the first expansion for Relic, introduces player-versus-player combat to the board game in an optional new "Enemies of the Imperium" game mode; in this mode, up to two players play as Nemeses, such as a World Eaters Berserker or a Eldar Dire Avenger, instead of characters. In addition to the four nemesis roles, Nemesis introduces two new player characters — an Eversor Assassin and a Storm Trooper Sergeant — with up to six players now being able to play at the same time. Nemesis also adds player-versus-player combat through a standalone "Apostates versus Devotee" mechanism; characters who choose to try to use new Apostate wargear — proscribed technology created by enemies of the Imperium — become Apostates, subject to the prosecution of other, more puritanical, Devotee characters. Finally, Nemesis adds four new Scenarios to Relic, such as the "Hulk of the Wayward Warrior", in which players must complete a clean-up mission of the long lost space hulk, Wayward Warrior, and the "Master Collector" scenario that requires players to bring precious but forbidden treasures to an infamous and reclusive Rogue Trader. *NOTE* This is not a complete game, Relic is required for play.